Scared. Nervous. Anxious. Concerned. Relieved. Excited. 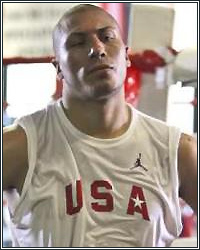 Such were the range of emotions experienced by hot East LA prospect and 2008 U.S. Olympian Shawn Estrada prior to and following last Friday's second-opinion prognosis what was first determined as a left shoulder injury which would require surgery and extensive physical therapy instead is a minor and highly treatable condition called "Left Long Thoracic Neuropathy." The second opinion -- provided by renowned Marina Del Rey-based sports medicine expert Dr. Fred Nicola from an Electrodiagnostic Report -- was founded on the fact that tests showed that a nerve in Estrada's left shoulder was not "firing" properly; in more layman's terms "a tired nerve." Dr. Nicola prescribed physical therapy three times weekly at the Diagnostic and Interventional Sports Care and Orthopedics (D.I.S.C.) Center in Marina Del Rey. He explained that the treatment would speed up healing and make the nerve function normally again. "It was right after my last fight," the 23-year old Estrada (2-0, 2 KOs) explained. "I was training back in the gym and preparing for my January 24 fight. I was sparring and tried to throw a left jab and hook and felt a sharp pain. I didn't think it was anything major." "My father used to tell me to always get a second or even third medical opinion, especially whenever surgery is recommended. And when I went to see Dr. Nicola and found out surgery wasn't going to be required, I was very relieved and excited." "I feel great. I feel like I can fight by the end of this month. But I'm not going to rush it. I'm going to do what the doctors say and stay on their timetable because they know best," said Estrada.